then you'll need to resuscitate it first. This guide isn't a cure-all, but there are steps you can take in order to give your trusty portable a fighting chance. Work through the following guide to see if you can save your device from a permanent watery grave. If you succeed, we'd love to know! Don't Turn Your Device on! 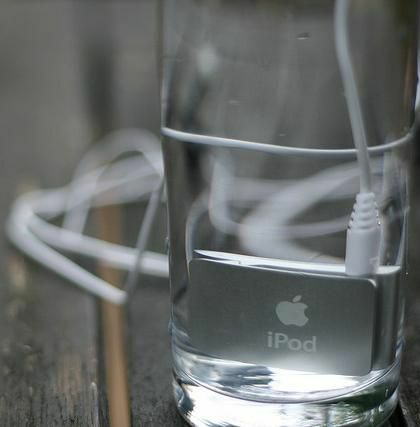 Whatever you do, the first thing to remember is never power up a water-logged electronic device. If you turn it on while it's still wet, then the water inside will short-circuit your device and will most likely kill it. If your portable was off when the accident occurred, you have a better chance of rescuing it than if it was already switched on. Even if it was powered up during your mishap, you might still be able to get it working following this guide. Take the Battery Out. If your portable has a battery compartment, then simply remove the battery cells. Many devices like MP3 players come with built-in rechargeable batteries that require the casing to be opened. You may have to search the Internet for the best way to do this for your particular device. As an alternative, you may prefer to use the Hold/Lock button on your device if it has one to prevent the unit from accidentally being switched on. Wash with Purified Water. It may sound strange to add even more water to your drenched device, but if you have dropped your portable into water that has dissolved mineral salts in it (like sea water), then you need to flush these residues away that might cause electronic components to fail. Disassemble your portable (using a screwdriver if necessary) so you can flush all the electronic parts properly with purified water (distilled/deionized). Even purified drinking water like Aquafina will do. Wash With Isopropyl Alcohol. To help remove water and dry your device's electronic components quickly, wash with isopropyl alcohol (IPA). Don't use IPA on your portable's display screen. Try not to wash with IPA for too long as it can damage rubber seals if left for prolonged periods of time. Dry Components. Prop up all the washed components on absorbent material such as paper towels. To accelerate the drying process you can use a desktop fan -- this process can take up to a week. Alternatively, leave the components in a warm (not hot) place such as an airing cupboard for 2 to 4 days. Another tip that people have had success with is to use rice (or other types ​of desiccant) -- a great moisture absorber! You could try wrapping your components in paper towels and placing them in a container of uncooked rice (up to a week). Reassemble and Power up. Once you are happy that all the components of your device are dry, use compressed air to give them a final clean -- especially if they've been sitting in a bowl full of rice for a week! Assemble your portable (remembering to reconnect/insert batteries) and power on! If you're lucky, your portable will now be resuscitated!